24 May 2016 – We recently spent a weekend volunteering at a sheep farm in Molesworth owned by Andy and Karen. It’s several hundred acres of land passed down to Andy from his family, currently being used to run cattle and sheep. It’s autumn and with that comes lambs at Bonnie Brae Farm. 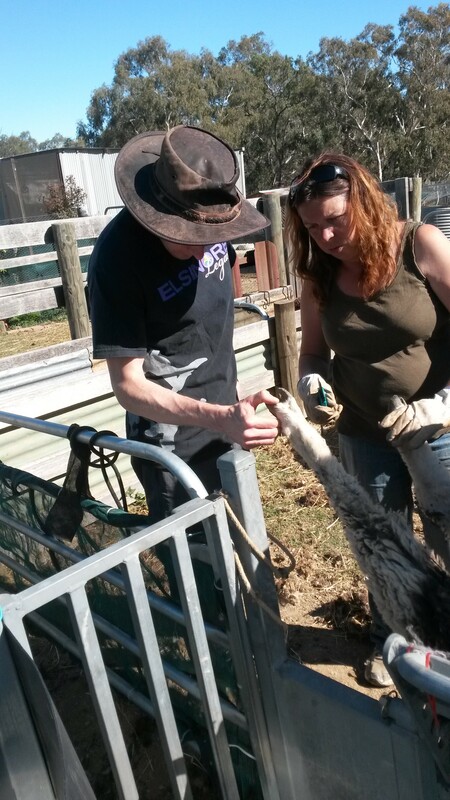 On this WWOOFING With Child adventure, we got hands on helping with the soon to be mothers. Karen’s focus on the farm is taking care of the sheep. They run Merinos, Corriedales, and Polwarths, focusing predominately on the higher end wool markets as their primary source of revenue as it relates to the sheep. Like Polwarths, Corriedales are a Merino/Lincoln cross that originated in Australia and New Zealand in the late 1800’s. They are considered hybrid meat and wool animals, meaning they are particularly good at producing both at levels of good quality. They have smaller heads than many other breeds, making them good breeders because of an easier birthing process that often times yields over 100% success rates (ewes often carry twins). Once producing lambs, they make particularly good mothers compared to other breeds. These happen to be the sheep I am most familiar with since I work with them on a weekly basis. Karen had wanted to conduct an experiment to see if she could easily detect the fetal heart rate of lambs in order to confirm which of her ewes were pregnant. To do so, we corralled the sheep through a system of races until they got to a special contraption designed to hold a single sheep in place and flip it upside-down. While upside down, we held the scanner to the sheep and slowly refined a technique for picking up the heart rate. Sure enough, all of the ewes we inspected were pregnant (according to the scanner). The old fashioned way of determining if they are pregnant is to check the udders to see if they are getting larger and filling with milk. To satisfy his skepticism, Andy ran through the mob of ewes, reaching under and grabbing udders along the way. We got a good laugh as he violated his way through the crowd of ewes. “Oo pardon me, comin’ through, pardon me!” He corroborated the pregnancies of most of the animals and would check later to see if we were right (he use a “rattle” – the term for a can of spray paint) to place a marking on each ewe indicating which we felt were definitely pregnant and probably pregnant. We tried to limit the amount of time each ewe was in the flipper (for lack of a technical term), because it can cause issues for the pregnancy by making the baby flip. While having them upside-down, we did quickly give their hooves a trim. In a sheep’s most natural setting, they spend a lot of time on rocky hillsides wearing down their hooves, which grow like fingernails. However, on pastured land (where most are kept) the hooves can become too long and cause issues. If the hoof becomes too long, moisture, dirt, and manure can become trapped in between the hard hoof and the flesh of the foot, which often times leads to infection and eventually more serious complications. We used a pair of curved garden snippers to trim each hoof as the sheep came through. The idea is to have them be as flat as possible, but caution should be taken not to cut too deeply and cause bleeding. Although not always a major concern, this can cause vulnerability to infection. Once cutting into the nail, healthy tissue will appear white. If any moisture and rot has gotten into the hoof it will not. When this happens, it’s advisable to trim as highly as possible to remove the rotting portion so that infection cannot spread. Once exposing it to the air, it will most likely dry out and heal on its own. Karen was originally a nurse by trade so has a keen interest in keeping each sheep healthy, more so compared to most farmers, and it’s obvious it’s out of a genuine care for her animals. Most would only trim the nails once or twice a year, at the time when the animal comes in for sheering, but she does it most every time they get handled. She also puts great care into sick sheep. One mother was being nursed back to health in a pen by herself and by the next weekend was totally healed. And, of course, she likes to tinker with fetal heart rate monitors (which most farmers would say is completely unnecessary). At the time of our visit, a few of the ewes had already given birth early. When a ewe gives birth, particularly if she is not a first time mother, she will separate herself from the mob and find a private spot to have her baby. This will be a vulnerable time for her, especially since predators (foxes particularly) have been on the prowl. Just one morning the previous week, Karen had found a ewe and her baby torn open. To help stop the problem, Andy has been up at night shooting to help deter them from making any attempts. 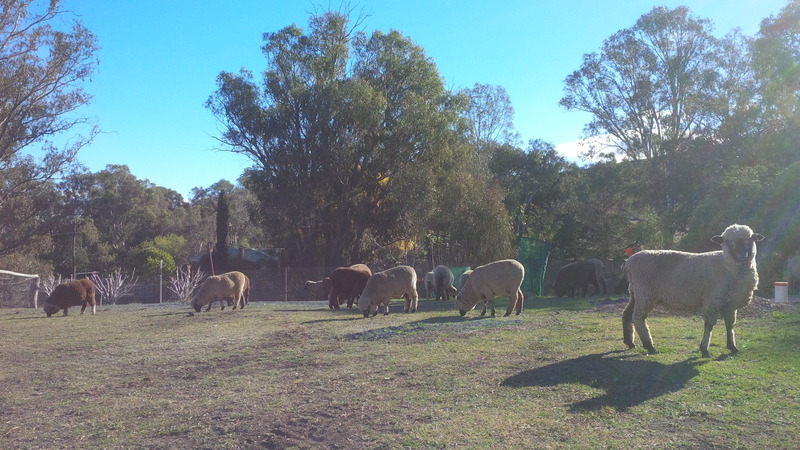 They’ve also been moving the expecting mothers into paddocks closer to the home. Using a gun is not the only way to deter foxes. Karen and Andy also make use of Alpaca’s as guardian animals. Alpaca’s were originally brought to Australia to be used for their wool but somewhere along the way it was discovered they can become quite protective of sheep. As long as you only have up to two alpacas with one mob, they will form a bond with the sheep and become quite protective. Although they won’t necessarily go to blows with the foxes, they will alert the sheep to their presence and make a bit of a ruckus in an attempt to deter the fox. Another option, not employed by Karen, is to make use of livestock guardian dogs (LGD’s). Certain breeds of dogs such as Great Pyranees will form a connection with livestock if left alone with them and will become quite protective. Not only will they fight off predators, but they’ll even get aggressive towards other humans that approach the mob, so caution is advisable when owning these dogs and having visitors. On Australian farms, the birthing process tends to happen on its own out in the paddock – the natural way. Mothers will go off into private and then come down in the morning with their newborn. This actually happened the first night we were on the farm. In the morning, Karen introduced us to the mob by calling them down for breakfast. Because Karen works closely with the animals, often times even hand feeding them, they have come to accept her as friendly and will come barreling down the hill at the sound of her voice (literally – we needed to stand to the side to avoid being run over). When the mob arrived, we noticed there was one Polwarth mother with a brand new baby lamb in tow. The way to tell how new the lamb is by if it still has a yellowish covering on it from the birth fluids. It’s worth noting some farmers, particularly in the US, will birth indoors under the watchful eye of the farmer. However, this has been shown to have certain disadvantages. In Australia, most sheep are born out under the stars. Much is said about the special connection a mother forms with her newborn. As humans, we experience this as soon as birth occurs. With sheep, it might not happen as quickly as you think. One of the reasons ewes separate themselves from the mob is so that they can have time to form this bond. If a mother and her baby mixes with the mob too quickly, the mother and baby can actually become confused as to who’s who. Sometimes, the baby ends up bonding with a different mother entirely. However, in most cases the lamb will spend enough time close to mum (within 2-3 days) where they become unmistakable to each other. Karen was worried about this when the new Polwarth lamb joined the mob in the morning, admitting it might have been a mistake to call them all down like that right after one had given birth. We observed them throughout the day and saw to our relief that the lamb was sticking with his mother and never got mixed up. At one point, we got to handle some of the lambs ourselves. In Australia, all livestock are tagged with an official ear tag color coded by year that also has the identifying information of the farmer. Livestock cannot be sold without proper identification on it. However, the color of the ear tag is not the only way to tell a sheep’s age. Normally this is done by counting the teeth. A permanent pair of incisors replaces the baby teeth each year until age 4, at which point they have 4 permanent pairs of incisors. Afterwards, degradation and loss of teeth is the primary indicator of age. Handling a lamb is as easy as picking up a puppy. They generally don’t wriggle around once you’ve got them in your arms. When applying the ear tag, the only thing to be cognitive of is that there is a blood vessel that runs through the ear that if you pierce can cause a lot of bleeding. For this reason, the ear tags are placed to either side of this blood vessel. Handling a fully grown sheep is a little more complicated than a lamb, but still not rocket science. They will generally move the opposite direction as you, so in most cases you simply make intelligent use of gates, laneways, races, and your own body position to herd them in the direction you want them to go. However, there often comes a time when you need to give them extra encouragement. I learned they do not like being grabbed at the base of their tail and that they are sensitive under their mouth. These two facts make it easy to control them. In the example of bringing them in for the pregnancy scan, I would walk into a small group of penned ewes, grab one under the mouth, lift it and turn it in the direction I wanted it to go, put her back down onto her feet, grab behind and below the tailbone, and push her in the direction I wanted her to go. Most of the time, she would go without issue. Sometimes, I had to use my body weight to get the rest of the way into the flipper contraption. 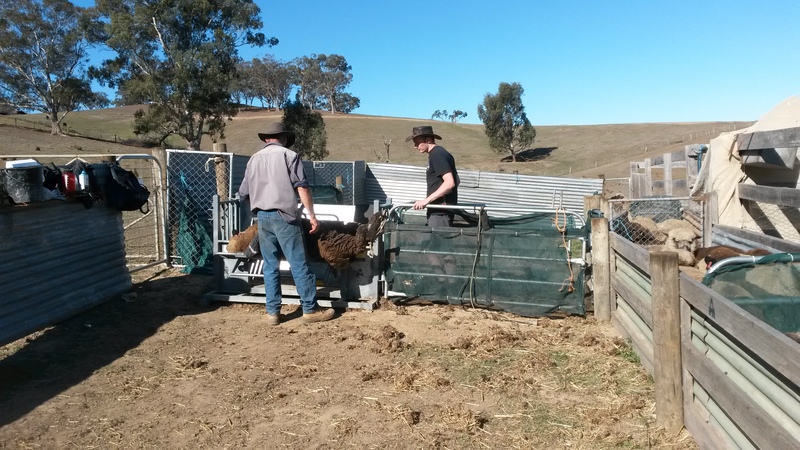 When removing a ewe from the flipper, we would try to encourage her to back out on her own so that she gets used to going in and out on her own. However, some refused to move. I learned from Andy that the easiest way to get a sheep to back up is to grab them by one of the hind legs and pull. They will naturally just start hopping backwards as you pull. As I refined my technique, he suggested grabbing higher on the leg (I was grabbing closer to the foot). At the time of our trip, this part of Australia was in the middle of a pretty good drought. Karen and Andy had been needing to supplement the animals since nothing is growing in the ground, and it had been getting harder and harder the more time that passes. One day during our stay, we cut up some trees called Tree Lucerne and put them through a wood chipper for supplementing the animals. Tree Lucerne (Cytisus proliferus) grows very easily once the seeds are established, often times getting to over a meter in height within months. 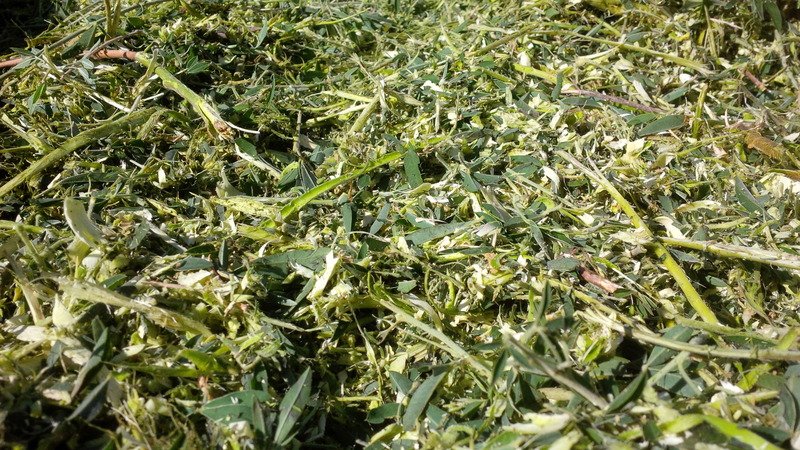 The leaves are very nutritious and the wood provides an excellent source of fiber. What’s more is that once you cut away the branches they will simply keep growing back. When asked if Tree Lucerne had any relation to the pasture grass Lucerne, Karen revealed the other common name to be Tagasaste. The light bulb immediately went off. This is a tree we have heard much about through our permaculture education, although we’d only ever heard it referred to as Tagasaste. They have them planted at Ceres, where Kristi got her permaculture design certificate, and David Holmgren (who coined the term permaculture along with Bill Mollison) has them planted at his orchard at his Melliodora Homestead. Encouraged by how many great uses for Tagasaste I’ve been hearing from multiple sources, I set out to see how easy it would be to grow in the US. Although it’s natural habitat is dry (like Australia), it can actually take well to a wide variety of climates. In fact, it’s even cold resistant to -10 degrees C. A single tree can produce over 200,000 seeds, one of the reasons it’s considered an invasive, unwanted tree in Australia . 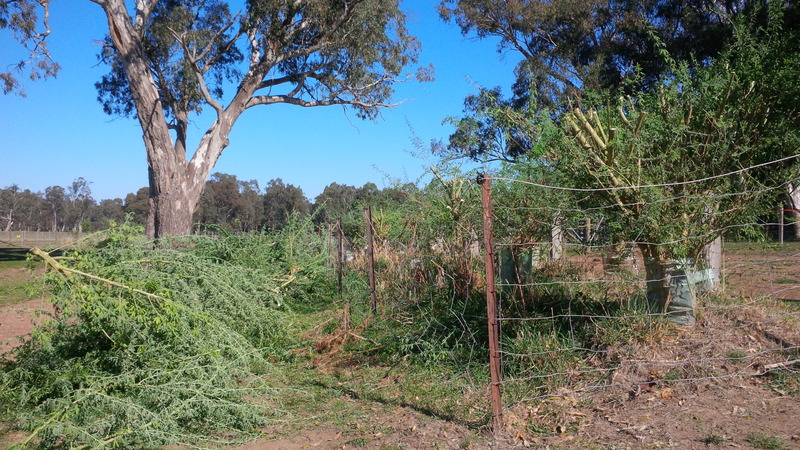 However, as we learned during a permaculture design course and at David Holmgren’s homestead, if you have livestock (especially goats) the plants will get devoured quicker than it can spread since they love the taste so much. In fact, Tagasaste is so beneficial to animals like goats and sheep that it can increase the carrying capacity of land by as high as 10 times. In addition to providing good nutrition for livestock, this tree will also provide flowers for bees during winter (learned from Holmgren) and makes excellent firewood (learned from both Holmgren and Karen). Karen and Andy were very hospitable during our time on the farm. In just a short amount of time, we learned a tremendous amount particularly about sheep. I was encouraged by how relatively easy they are to handle and it further reinforced for me that if I really wanted to, this would be something I could handle if we decide we want to have sheep as livestock. They are hardy animals, relatively low maintenance, good mothers, and easy to handle because of their small size. Additionally, if you spend the time to interact with them they won’t view you as a threat. I suspect if we decide we want to keep sheep, that it would probably be as a source of red meat that’s easier and cheaper to manage than cattle. Of course, they make excellent lawn mowers too! I wish we could spend more time at Karen and Andy’s farm, although with our only having availability on weekends this may end up being our only trip. Regardless, I enjoyed our time there and look forward to the next time I get to be as hands on as Karen and Andy were willing to permit. Oh, and on the Child part of WWOOFING With Child, the toddler tag-along had a GREAT time. She loves interacting with animals, touching and playing with anything green, and covering herself head to toe in dirt. One more successful farming adventure with the child, complete.